Brutal Half-Life is a modification that makes the game more violent and addictive. It is also a tribute to the classic FPS games. 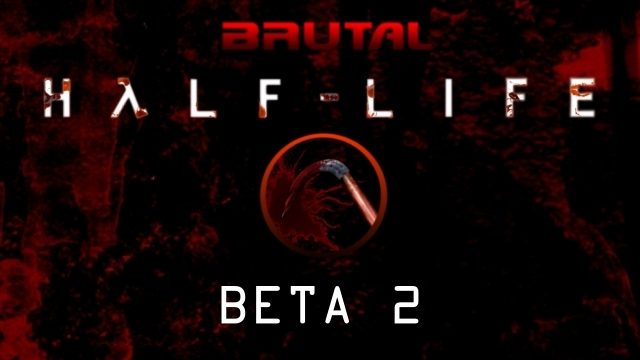 Public beta 2 of Brutal Half-Life. Still needs lot of work but it is stable enough for a release. I will continue adding more features in future versions. Hell yeah! Let the DLing begin! if you don't own hl1 on steam put bhl_beta2 in the hl1 folder, if you have a hl1 shortcut copy it, right click properties, go to the end of target and add -game bhl_beta2. apply click the shortcut, if not create a shortcut and do the corresponding steps. I AM GLAD YOU ARE BACK!!!! it's perfect! I love the fists and labcoat mechanics! it deserves a full 10/10! not even joking! I just got a couple of questions. 1: are you planning on re-doing all of Quake 1/2 and DOOM 1/2 levels? 2: what happened to MP40 and Chaingun Cannon/Ripper? did they get scrapped? 3: what inspired you to make a Quake level/difficulty selection? I keep getting a Fatal Error crash. Happens randomly when i click to fire a weapon. So far it happened most prominently with the Shotgun and the Revolver. this mod feels really broken, like first of all, why is barney so op? and why are the weapons for him randomised? you should've gave specific barney specific weapons in a specific map so it would be balanced, and why are vorts the same as vorts in hard mode, no joke i was playing in normal mode but vorts were fighting like in hard mode, another thing, when i tried to kill houndeyes with the satchel and none of them exploded, instead they were just burning, and burning does nothing to them it's just some cool effect, and i somehow managed to kill a tank with 1 simple tau cannon charge, and i remember you saying that you added more enemies in the campaign, well guess what, there are no more enemies, it's the exact same as hl1 campaign, and why did you added stuff like plasma rifle and bfg in the end of doom 1's e1m1 and doom 2's map01? besides these extra maps are the only time i see these weapons, not in the campaign, and why can't i get dual desert eagle in the campaign by placing it somewhere? instead of forcing me to kill barney, and i didn't kill barney at all in this campaign, so i never got dual desert eagles, and what's with making glock silencer only to fassns, even though i can only get glock silencers in the end of the game, by the way after apprehension i never ever got dual magnums because of the weapon placement in original hl1, also some ideas are so ******, like i have to wait for 0.5 seconds for gordon to do stupid animation in order to throw a satchel for "realism", or i have to wait for gordon to do animation in order to place the tripmine, or how i can't hold primary attack in order to use a crowbar so i have to just click it, and why do scientists/barneys/agrunts heads disappear, making me quicksave and quickload? and scientists for some reason can turn brown or red, making me quicksave and quickload too, and what the hell happened to chaingun cannon and m40, you for some reason didn't say that they're cut from the mod, they were just unexpectedly cut, and what the hell is with the glowing sprites on items, when i picked the items up the sprite was still here, and that's the issue from bhl beta 1, so i don't get why wouldn't you just remove it or fix it since you had 3 years, and you said that gordon himself will have gibs, well gordon doesn't even have his own gibs, and i already tried it, and what happened to bhl deathmatch? if you would cut bhldm, then say it, don't just cut it unexpectedly from beta 2, in all honesty i expected alot more from bhl beta 2, but when i played it i had fun and not fun at the same time, it's just so badly planned out, and it feels so rushed, i hope that you will somehow fix it in the next update (hopefully not 5 years) or better yet, create a patch that fixes all the issues i have talked about and possibly anyone else's issues. He said: "Still needs work..."
Well, I think you are doing a nice statement here with a lot of critical bugs that need fixes, but also I can see the anger growing, which will not help the mod at all. I was one of the beta 2 testers and also told him there are some critical bugs and problems and I would personally delay a release. Let us hope he has the power to continue the mod. Thank you for reporting the bugs. I want this mod to work as well as possible. Also, I like Barney being OP. Makes him useful for once. you know how in blast pit there was a scripted sequence where hgrunt shot the grenade from mp5 at you? well in bhl beta 2 it's possible for it to be a m249 hgrunt to shoot an mp5 grenade thing at you because it's m249 grunts are randomised so as barneys, which is lazy"
Who the hell honestly cares? I can't tell if you're serious or not, I really mean that. at least you still can play the game. I mean like, At least we got Brutal Half Life Beta 2, its not like what we maybe expected, but at least still kinda fun to play. I love Barney randomised weapons!!!! plus game experience! Command impulse 101 is not working.